Learn to read the face, nails, tongue and body to understand indications of lines, blemishes, marks and colours. Understanding the cues of the organ/body correspondences is a precious gift (and a curse). Indications of hot, cold, damp dry and wind conditions can easily be read once you train your eyes to see. Margi Flint shares the knowledge learned from her teachers and clients over the past three decades. – Facial signs: lines and markings of the tongue, ears, eyes, mouth and nose and their organ/body correspondences. – Significance of tissue color in diagnosis. – Signs of hot, cold, damp and dry conditions. – Elimination analysis by stool and urine appearance. – Discussion of herbs for organ systems. – Use of pulse analysis when selecting remedies. The weekend will be spent partly in lecture and partly in looking at the face, tongue and nails of participants as well as pulse-testing for confirmation of herbs. Each day concludes with a plant meditation. Margi Flint owns and operates EarthSong Herbals, a busy family practice and herb school in Marblehead, Massachusetts. For over thirty years she has worked as a labour coach, polarity therapist, and herbalist. She has been Adjunct Professor at Tufts University School of Medicine where she taught a four-week rotation in clinical herbal medicine for Fourth Year Medical Students and practitioners at Union Hospital and her clinic in Marblehead, Massachusetts. She continues to teach Herbal Pharmacology at North Shore Community College, and for The Masters of Applied Natural Products course at Massachusetts College of Pharmacology. 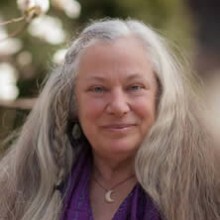 She is a professional member of the American Herbalist Guild and serves as an Herbal Mentor for those who aspire to professional membership in the organization. She oversees two Practitioners Circles, one at her clinic in Marblehead and one in Newport Rhode Island.